Racing springs for original clutchesfor MALOSSI FLY and DELTA clutches. Pre-hardened carbon steel springs, with high yield strength, that are protected by a high heat-resistant paint in various colours. The different colouring shows the stiffness of each spring series. 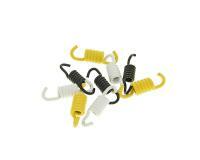 Malossi racing clutch spring set for original clutches in 3 spring weights. black = light (touring) White = medium (sport) Yellow = hard (racing) harder springs are necessary when tuning work has been carried out. Clutch engages at higher revs for greater pull. Easy to swap over, but the clutch must be removed.